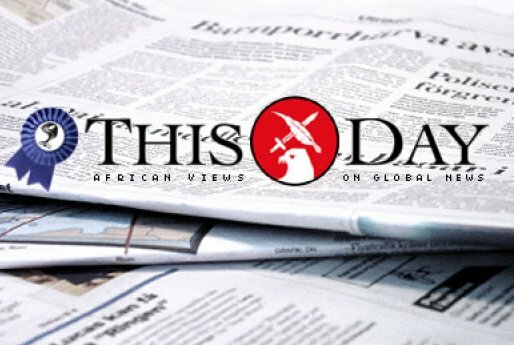 Thisday Newspaper Nigeria is a Nigerian national daily which was flagged off on 22 January 1995, with its head office in Apapa, Lagos State, Nigeria. The tabloid soon carved out a niche for itself in business and political reporting and for breaking big news stories, becoming one of the most circulated and read newspapers in Nigeria. In its first few years of publication, Thisday won the Newspaper of the Year Award for three consecutive years. In 1997, Thisday also became the first Nigerian newspaper to introduce full-colour printing. It now has printing plants in Lagos, Abuja and in the Niger-Delta and has offices in all the 36 states in Nigeria, the Federal Capital Territory, Abuja, and around the world. Thisday Newspaper Nigeria publisher Nduka Obaigbena was noted for his early investment in colour printing, giving the paper a distinctive edge among the few durable national newspapers that exist in Nigeria. As of 2005, Thisday Newspaper already had about 100,000 copies in circulation and an annual turnover of some $35 million (US). Thisday was at the forefront of the battle against the dictatorial military rule for which its reporters were invariably detained and harassed. The Chairman and Editor-in-Chief were detained in 1997 at the Department of Military Intelligence (DMI) for seven days under late Gen. Sani Abacha administration. The Chairman later went into self-exile. In October 2008, Thisday launched ARISE, the global style and culture magazine. The debut issue was given away at Thisday Africa Rising concert at London’s Royal Albert Hall and was so well received that the second issue officially launched on newsstands in February 2009. Thisday Newspaper Annual Awards for Excellence which takes place at Thisday DOME in Abuja’s Central Business District has attracted several world leaders and statesmen including former US Presidents, Bill Clinton and George W. Bush, former Mexican President, Vicente Fox and former UN Secretary-General, Kofi Annan. Thisday Anual Awards for Excellence has also hosted the former United Kingdom Prime Ministers Tony Blair and Gordon Brown along with former Prime Minister of Australia, John Howard. Former US Secretaries of State Condoleezza Rice, Henry Kissinger and General Colin Powell have also participated along with other international dignitaries including the former German Chancellor, Gerhard Schroeder, the former Prime Minister of France, Dominique de Villepin, former Irish Prime Minister, Bertie Ahern and Harvard Professor Larry Summers, a former Economic Adviser to President Obama, former World Bank President James Wolfensohn and Steve Forbes, the publisher of Forbes magazine. Other keynote speakers have included prominent Washington insiders and analysts, like Andrew Card, William Kristol, Karl Rove, Paul Begala, Howard Dean, Donna Brazille, and Paula Zahn. Today, Thisday Newspaper Nigeria remains one of the preferred newspaper among the business, political and diplomatic elite, and is easily the most recognisable and influential national media brand globally. Thisday Newspaper Nigeria has not stopped tapping into current technological advancement. The national news daily is also on various social media platforms including Facebook, Twitter and Instagram in the bid to reach out to a wider range of people both in Nigeria and abroad. Today, The newspaper has over a hundred thousand followers on Facebook and about 902 000 followers on Twitter out of which its majority are youths, thereby giving the national dailies a good boost to its mission of bringing the world to Nigeria and taking Nigeria to the world. Having its headquarter on 35 Creek Road Apapa, Lagos, Nigeria, Thisday Newspaper also has a downloadable app for all android phones. As one of Nigeria’s most authoritative news media, it makes itself available on all platforms for the political, business, professional and diplomatic elites and broader middle classes while serving as the meeting point of new ideas, culture and technology for the aspirationals and millennials. Thisday Newspaper Nigeria app gives a direct feed from of every news reported on the newspaper. The app proves to have everything a user will find in the physical newspaper which includes sections for breaking news, business, sports, life and style, politics, health and wellbeing, back page and commentaries. The free software application also engages its users by allowing them to contribute to the newspaper’s news cycle through the ‘send us your news’ option. Readers can also upload their news reports with videos and photos.